Jill and I want to say thanks for the unforgettable memories that we have from our trip. Please pass along our thanks to Kerry and Chelsea, who were fantastic! Even though the weather did not cooperate the whole time, they both always made everyone feel safe and comfortable. Special thanks to Kerry who helped pull Jill and I back on course when Mother Nature had other ideas. As for Chelsea, Jill and I were impressed by her calm temperament, which always helped to create a relaxing mood around the campsite. I would be remiss if I didn’t mention the stars of the show – the Orca! In one word – inspiring! When I heard them passing by the camp site from inside our tent at midnight on the first night, I knew the next day would be exciting and I was not disappointed. From their early morning appearance at breakfast to their visits at lunch and dinner, it seemed that they wanted to join us for some of the delicious meals that Kerry and Chelsea prepared. I guess Kerry and Chelsea were too humble to take the credit because they kept pointing out that Gillian was the artist behind the culinary creations. It was all delicious and there was always plenty for seconds, or even thirds! And all the snacks throughout the day were great too. One of our favourite moments was dinner on Wednesday evening when the Orca made a very close pass by the large rock near the campsite that juts out into the water like a little peninsula at low tide. When we saw them headed for us, we all ran out to stand on the rock so we could get as close to them as possible. Coincidentally, this was just as dinner was coming off the stove, so not wanting to disturb the show, Chelsea brought a full plate out to everyone while we were on the rock watching the orca. What a way to eat dinner! And as if they could smell the delicious food on our plates, the Orca came right up against the rock; so close that we could practically touch them! Awesome! And, as if planned, the best was saved for last – sharing the water with the Orca. As we kayaked back on Thursday we encountered a pod that headed right towards us and seemed to be led by the biggest Orca we had seen on the whole trip. We’ll never forget sitting silently on the water watching them come towards us while listening to their calls on the hydrophone. We’re already talking about when we can do it again! Thanks so much! A big thank you for organizing a great holiday. Our expectations were high yet you managed to exceed all of them. The food was incredible, any chance we could have some of the recipes, I’ll buy your first cookery book! Here it is, next year, and I am back with six friends. Who would have thought it could be better than last year? What an amazing trip, whales swimming under our kayaks, bears on the Islands, and of course the laughter. If laughing is good for the soul, I am good to go. The guides were perfect!. Their knowledge of the ocean, the Islands and wildlife was only exceeded by their great sense of humour. This trip is the bench mark for all future trips. We have been back from our vacation just a week. We had such a great time with you & everyone else. It all seems so long ago, yet the feelings & emotions are very tangible. We so enjoyed everyone’s company-they were brilliant with the children & I thought we all got on so well. It was very sad leaving you all. It wasn't until we left that Gavin realized that he'd been eating vegetarian- your cooking was that good! The rest of our holiday was as good as the start, Canada is truly beautiful & we can't wait to come back. Once again thank-you! Thank you guys! The trip was better than I could have imagined, and the experience has me thirsty for more. Being with the whales was really magical as well as incredible. 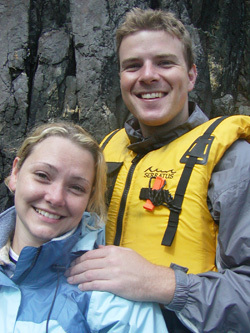 As for the guides, I think we lucked out with Brian and Gillian. I know that each one of us had a great time, and I'm looking forward to coming back next year. I felt safe in the hands of professionals and learned a lot. I would especially thank Brian and Gillian for a wonderful Orca-trip with delicious food. We really were spoiled by both of you. It was a superb experience and we will never forget the moments when we were surrounded by the orcas. We can't still believe we see all of this during our kayaking maiden trip! We very much enjoyed the rest of our journey on Vancouver Island.